With 25,000 ankle injuries happening a day in the U.S. there are a lot of people looking for a solution for their ankle injury or chronic ankle instability. Unfortunately, ankle bracing is something that people are not well educated on or have heard misconceptions about through the grapevine over the years. The Certified Athletic Trainers here at Ultra Ankle strive to provide the best ankle bracing solution to each customer based on their specific needs and we hope to do that through education, providing research, and answering any questions about ankle bracing that athletes, parents, or coaches may have. This article hopes to clarify the different ankle brace designs available on the market today and to provide you the necessary information to choose the right ankle brace for your ankle condition. If after reading this article you still have questions about which brace is right for you, send us a message and we would be happy to help. Lace-up ankle braces were first invented in 1887 as a basic corset design that uses laces or Velcro to bind the ankle to restrict all ankle range of motion. Today these lace-up braces will typically have straps that wrap around the ankle in a figure-8. Since these braces can be laced up as tight as possible, they may give the wearer a false sense of support when they are first applied, however they lose support quickly as they resist the ankle’s natural range of motion. While lace-up ankle guards may feel comfortable because they are made out of fabric, this fabric is also less durable and will easily rip and tear over time… not to mention absorb odors and start to smell pretty bad. Research studies have shown that lace-up ankle braces can restrict performance by resisting the natural ankle range of motion. This is one reason why we recommend athletes wear a hinged ankle brace for prevention purposes – this way the ankle does not weaken over time due to being held tightly in place. While all hinged ankle braces are not the same, they do provide the necessary range of motion to enhance ankle strength and performance unlike the lace-up type braces. Overall, the lace-up ankle brace is designed for individuals on a budget needing mild ankle support that are not engaging in competitive and/or high intensity activity. Some of the better brands in this category are McDavid®, ShockDoctor®, Cramer® and ASO®. Hinged ankle braces were first introduced commercially in 1985 when I created a brace that utilized a pivoting hinge connecting the bottom foot section on both sides of the ankle to an upright section that was secured with a strap to the lower leg. This design went on to create the foundation of ankle bracing company Active Ankle® Systems. The innovative hinge design offered the athlete free up and down ankle motion to run and jump without restriction. With the brace moving with the ankle, and not against it like with lace-ups, the brace stayed securely in place maintaining longer-lasting ankle support. Since the hinged brace is typically made with a semi-rigid plastic they can be durable enough to last a few sports seasons however have been known to crack/break a lot in recent years due to an adjustment in the materials being used by certain brands. Since these braces are typically meant to go under the insole of the shoe, they tend to move with the shoe rather than the ankle joint which increases the odds of an injury as well as creates unneeded space between the joint and the brace. The closer to the ankle a brace can get, the more control over excessive joint movement it will have. After years of studying hinged ankle braces and where their technology was falling short, we introduced the most modern ankle bracing technology in the year 2000 – hinged-cuff ankle braces. This design utilizes a pivoting hinge connecting the bottom foot section to the upright section. The upright section is designed with a cuff that encircles the posterior or rear of the lower leg. The addition of the cuff design helped to provide rotational stability to help prevent the more severe high (syndesmotic) ankle injuries. Hinged-cuff ankle braces are also crucial in helping to prevent low ankle injuries caused by excessive ankle turning by providing the support needed to keep the ankle in place while still allowing it to move as it naturally should. 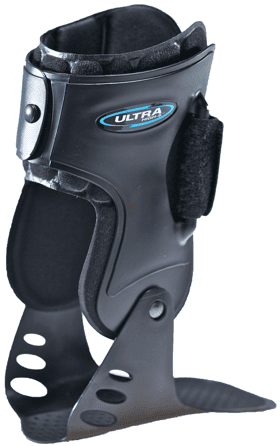 At Ultra Ankle® our hinged-cuff ankle braces are made with a flexible plastic outer shell called Performathane® that will typically last three sports seasons. Both the Performathane shell and padding system uses body heat to create a form fit to the ankle. Our braces are worn right over the sock, as opposed to inside or outside of the shoe, to get as close to the joint as possible for optimal levels of comfort, support, and durability. Hinged-cuff ankle braces are the best ankle brace for individuals and athletes to wear for mild/moderate ankle instability, chronic ankle instability, or for acute ankle injury bracing. No other type of brace gets as close to the ankle while allowing it to retain its strength and full range of motion during activity. 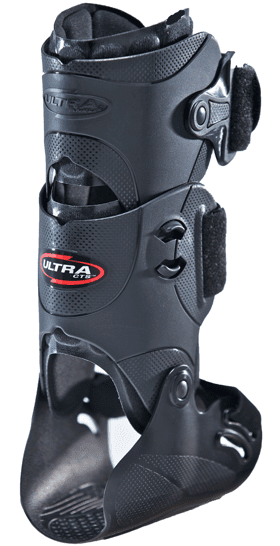 Popular brands are Ultra Ankle®, Don Joy® and Ossur®.